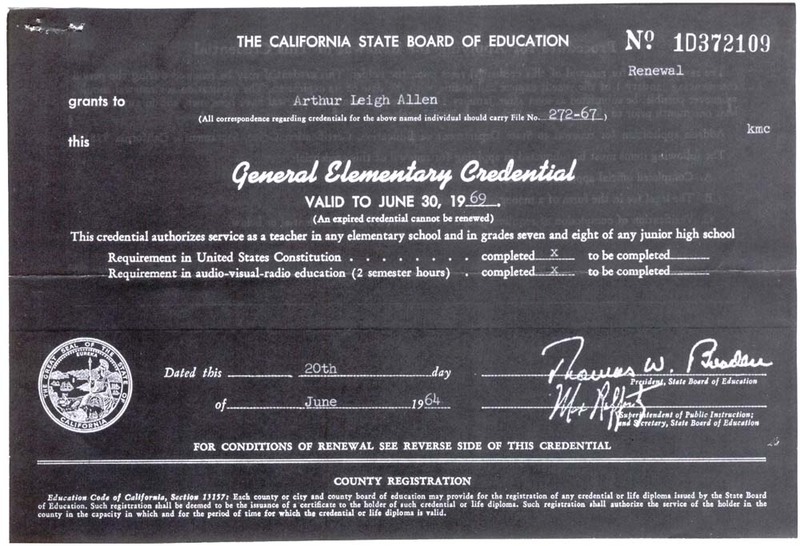 From late-1966 until March 1968, top Zodiac suspect Arthur Leigh Allen was employed as an elementary teacher by the Calaveras County (Calif.) Unified School District. 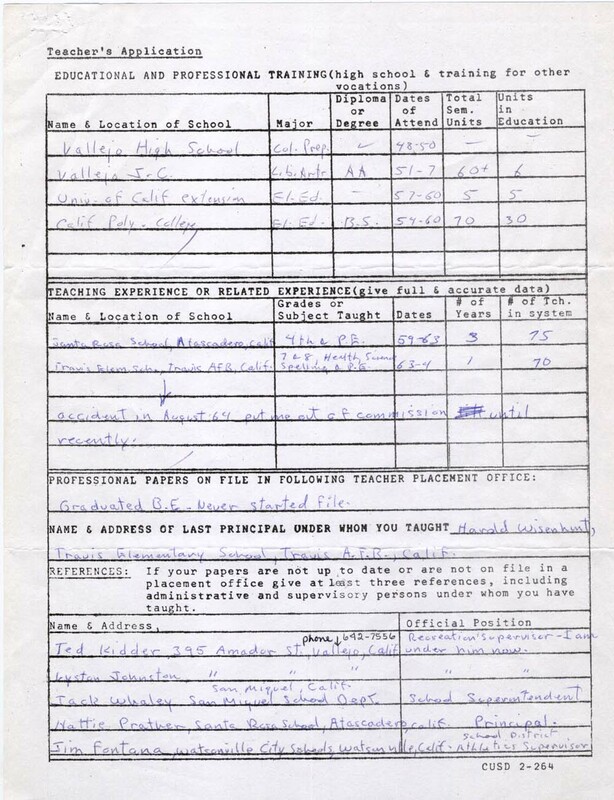 About six years ago I managed to obtain his original personnel file. 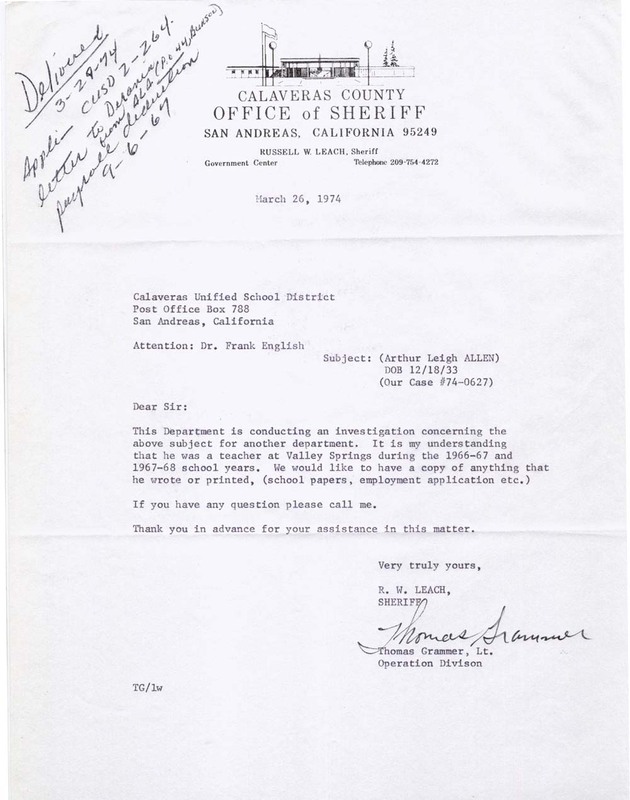 Included in the file are 30 documents, spanning from Allen's two-page job application to inquiries made by law enforcement agencies long after Allen had been forced to resign after molesting students. 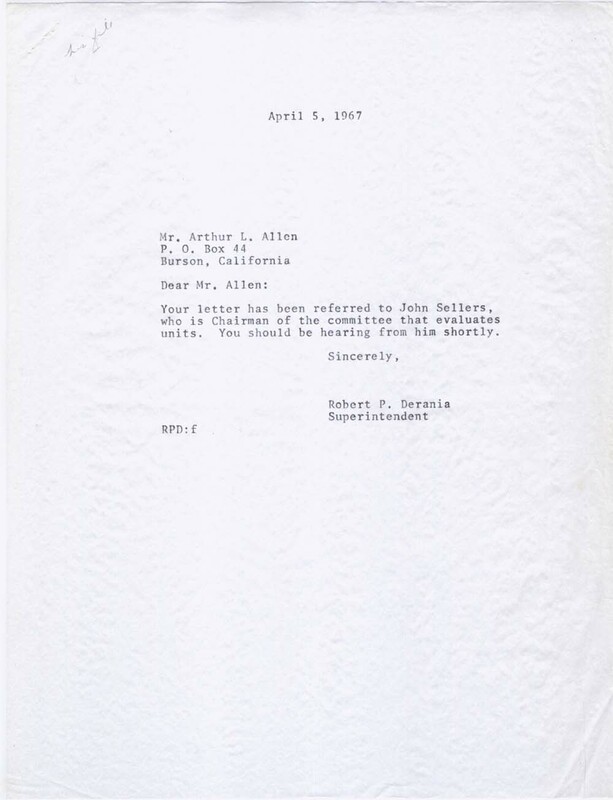 Allen's letter of inquiry. Dec. 12, 1965. Letter to Allen from school official. Dec. 23, 1965. 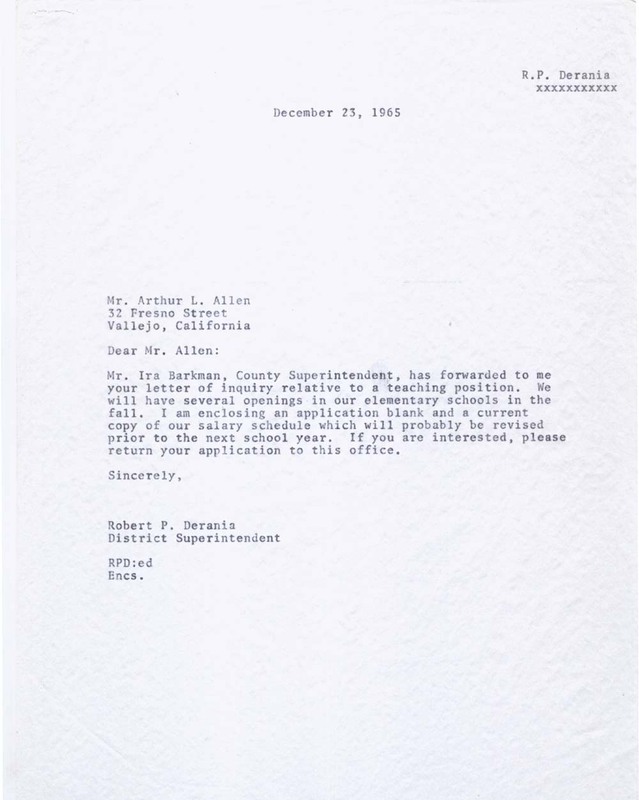 Page one of Allen's job application. 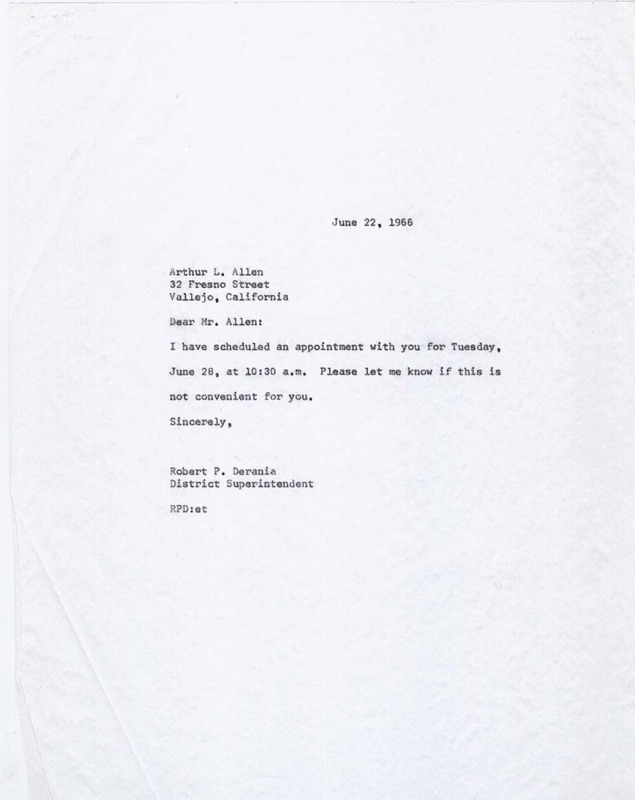 June 18, 1966. 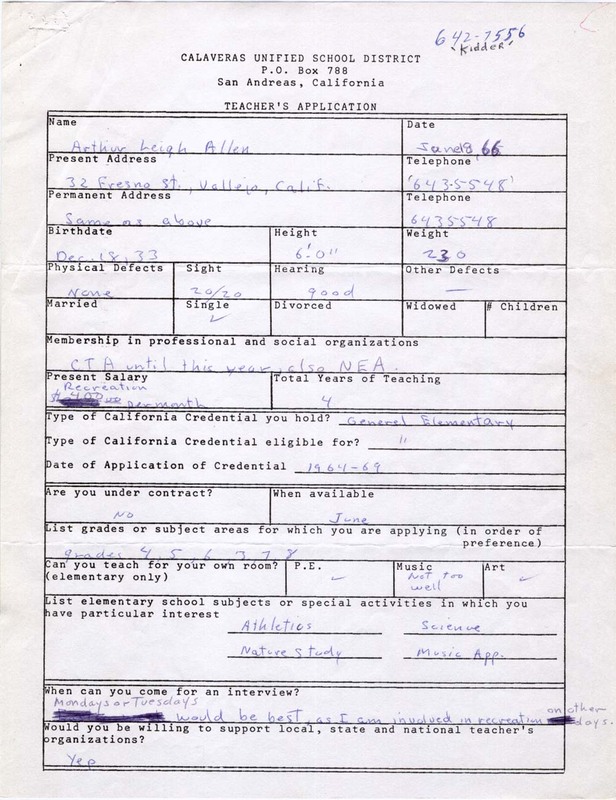 Page two of Allen's job application. June 18, 1966. Letter to Allen from school official. June 22, 1966. 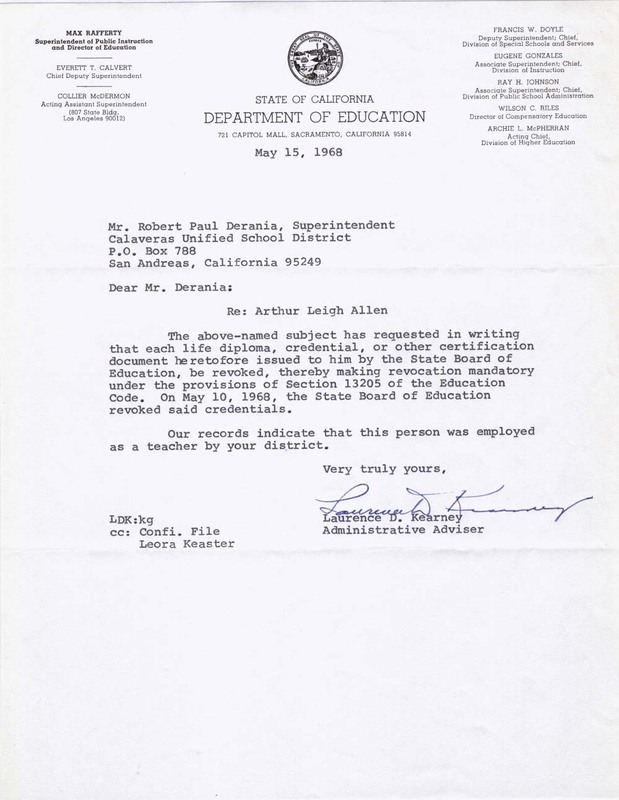 Letter from school official to previous employer. June 22, 1966. 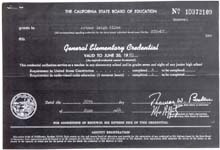 Photostat of Allen's teaching credential. July 18, 1966. 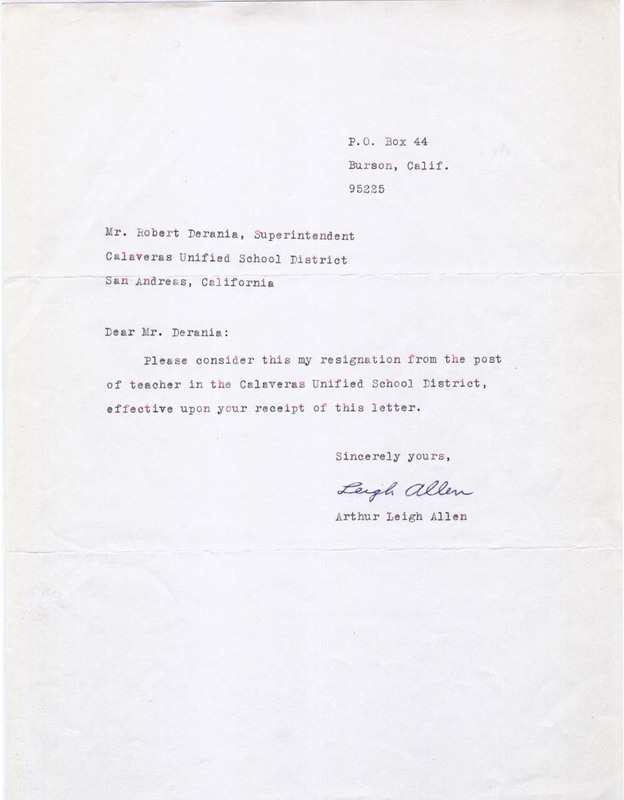 Letter from Allen to school official. July 18, 1966. 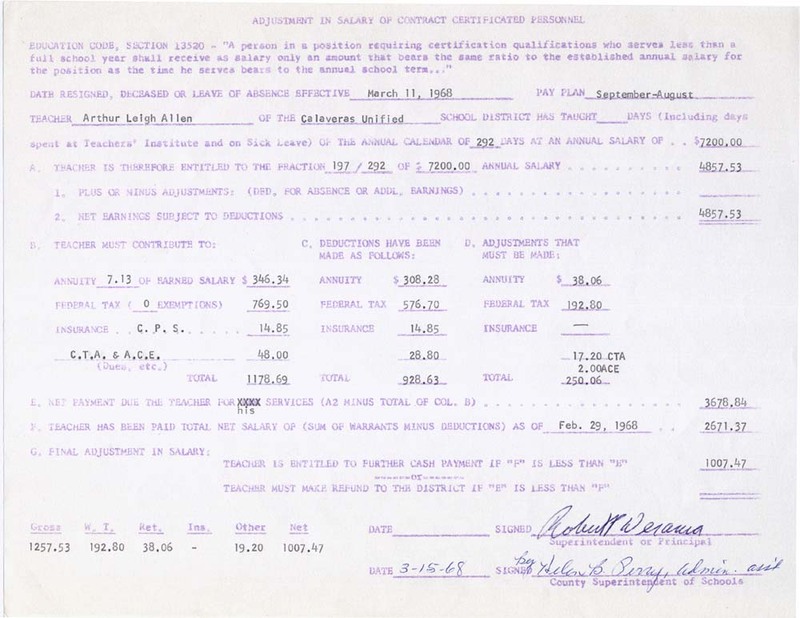 Allen's tax form. Sept. 8, 1966. 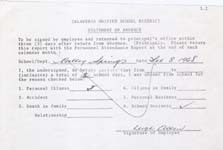 Allen's retirement form. Sept. 23, 1966. 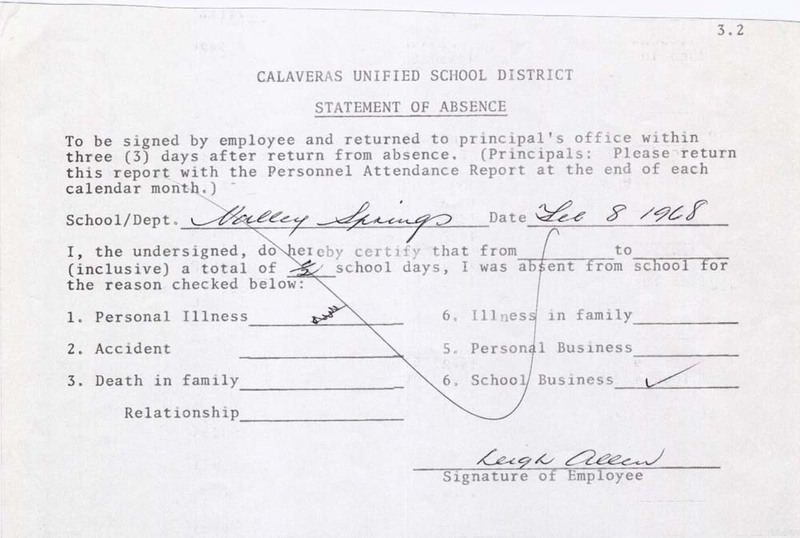 Allen's absence slip. Nov. 1, 1966. 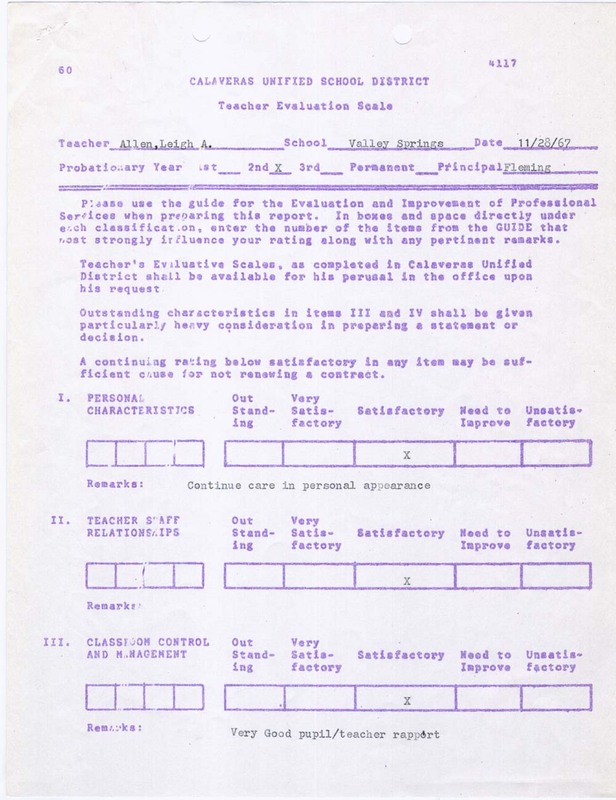 Page one of Allen's teaching evaluation. Nov. 30, 1966. 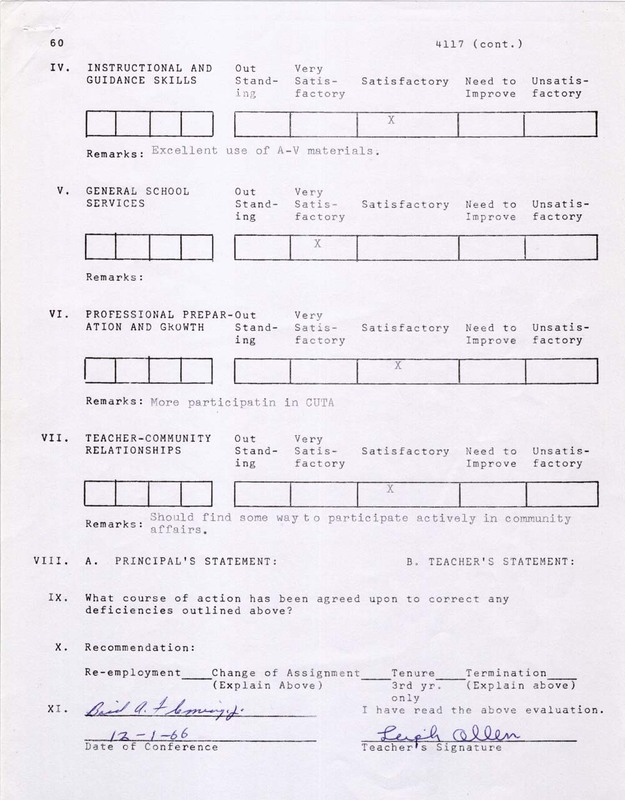 Page two of Allen's teaching evaluation. Nov. 30, 1966. 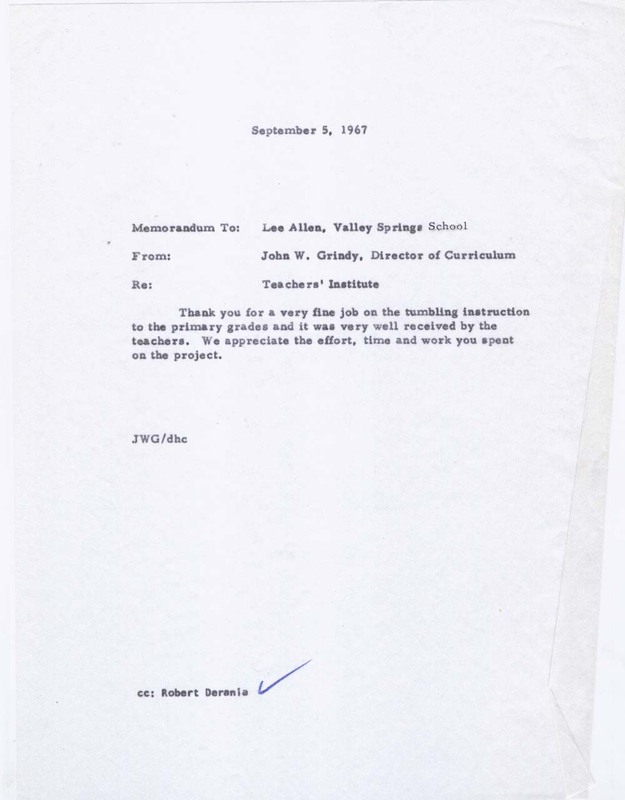 Allen's letter to school official. 1967. 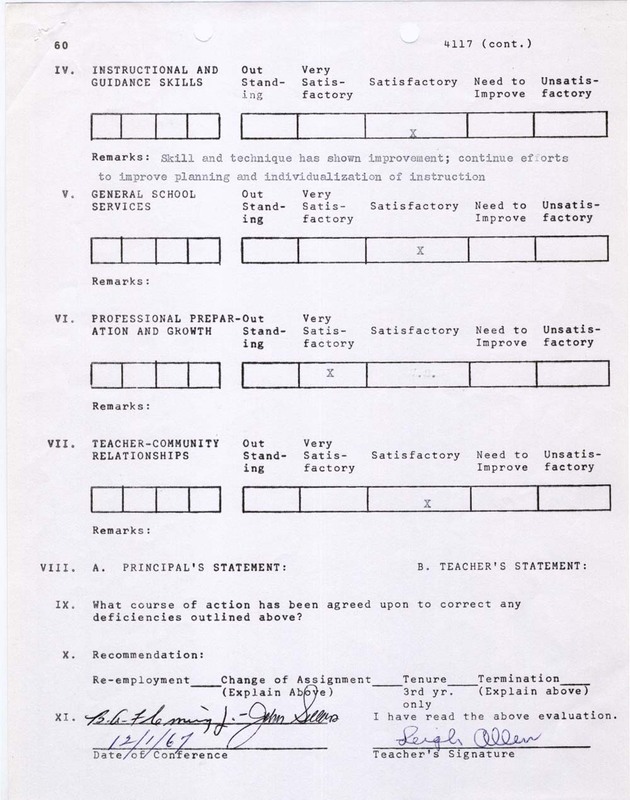 Page one of Allen's teaching evaluation. March 10, 1967. 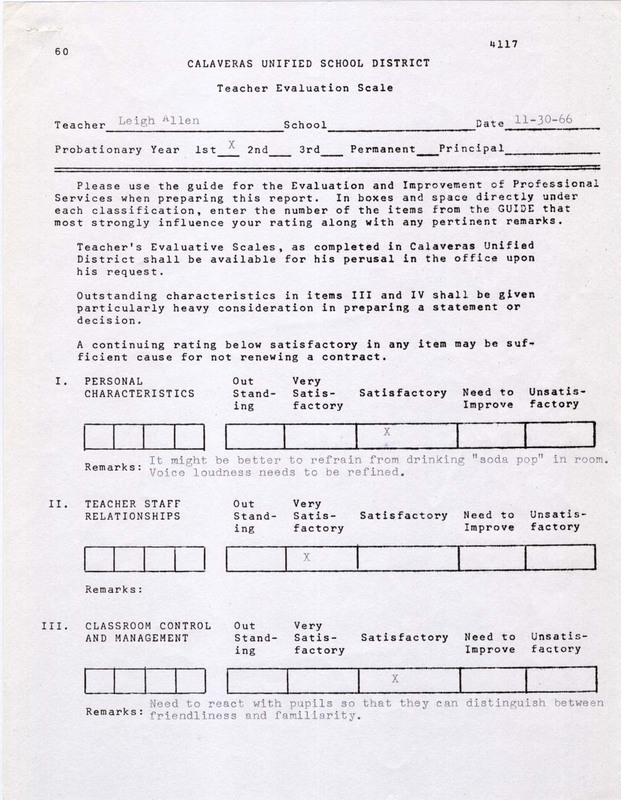 Page two of Allen's teaching evaluation. March 10, 1967. 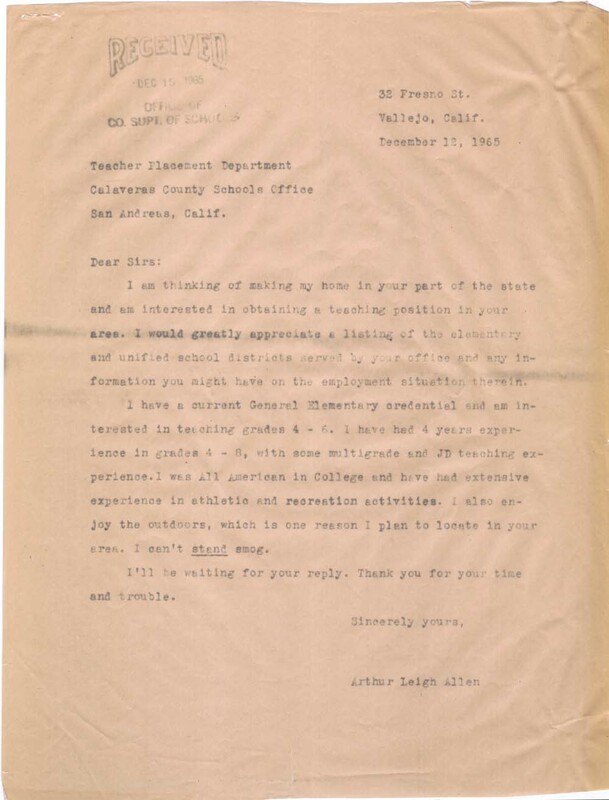 Letter from school official to Allen. April 5, 1967. 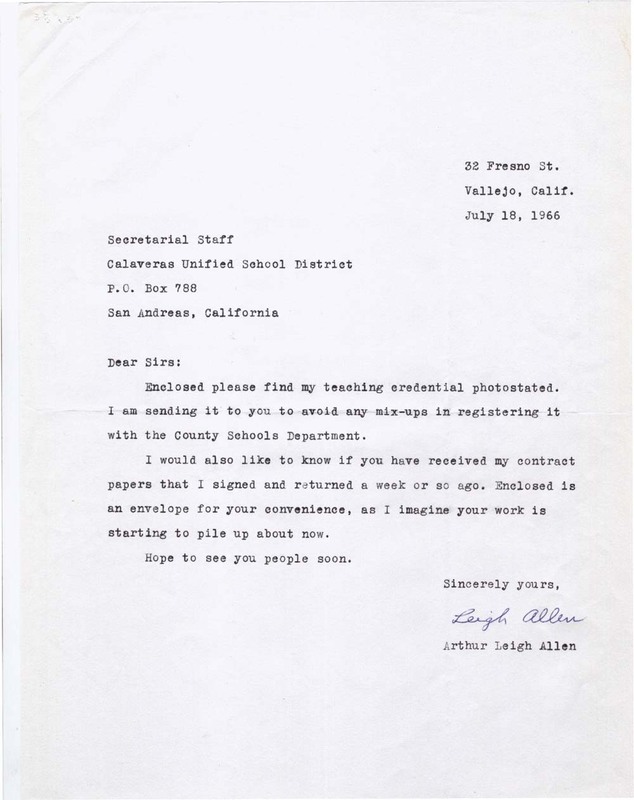 Letter from school official to Allen. Sept. 5, 1967. 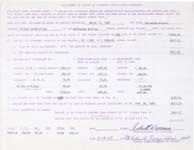 Allen's payroll form. Sept. 6, 1967. 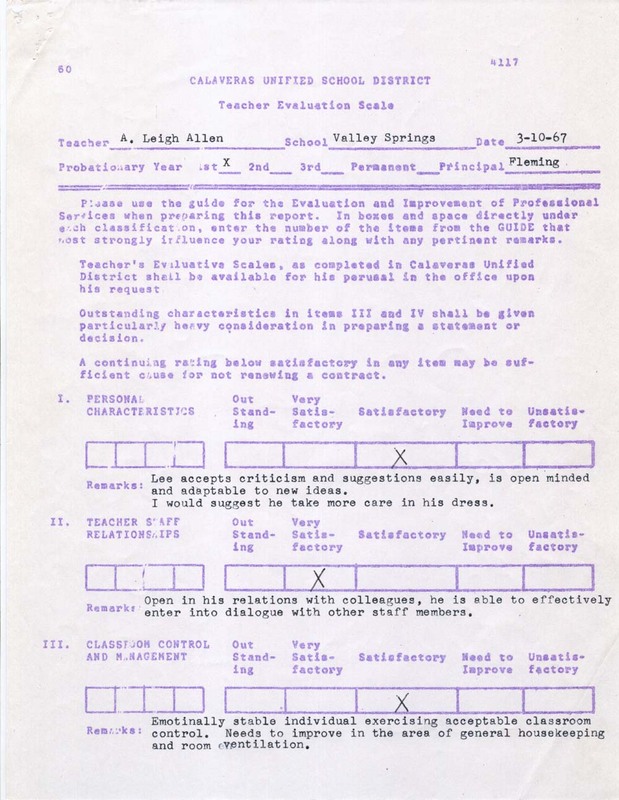 Page one of Allen's teaching evaluation. Nov. 28, 1967. 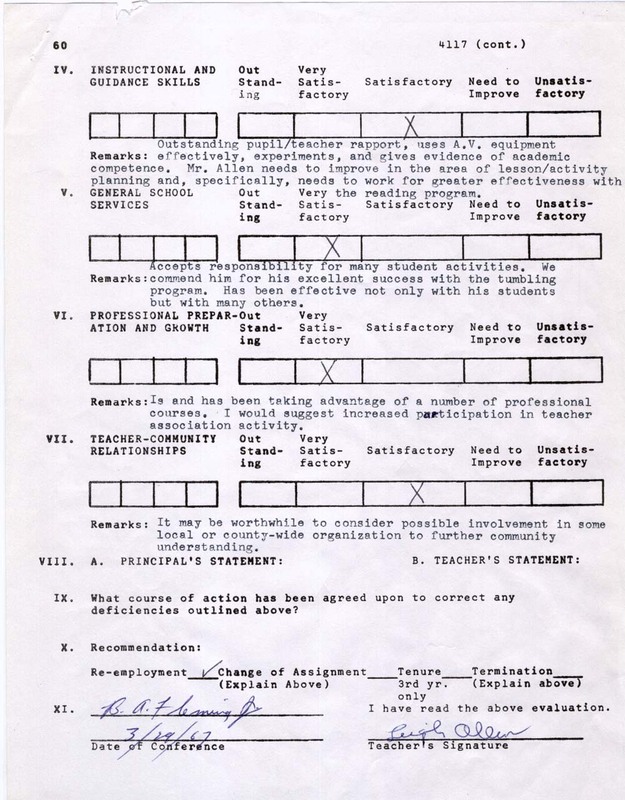 Page two of Allen's teaching evaluation. Nov. 28, 1967. 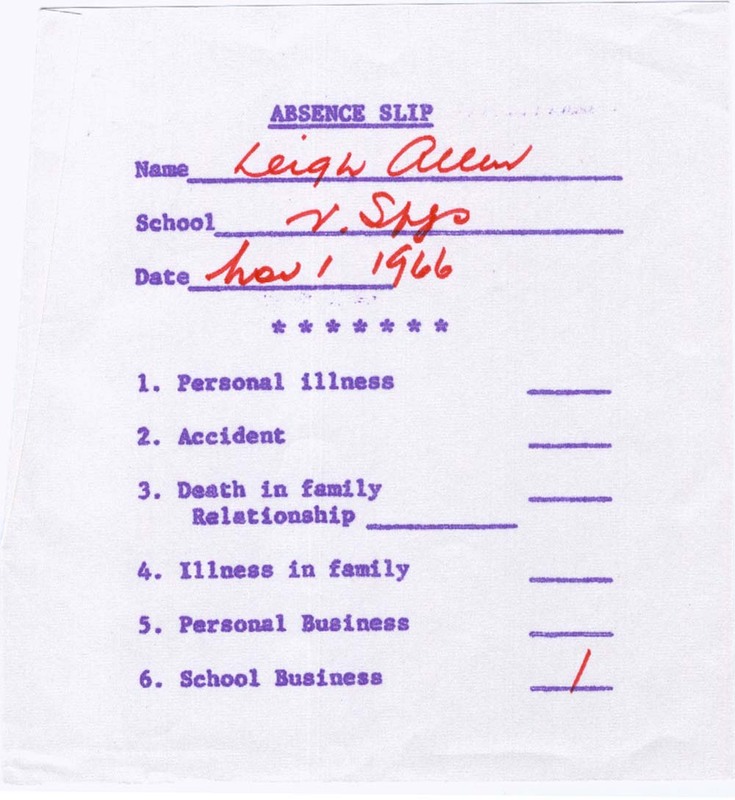 Allen's absence slip. 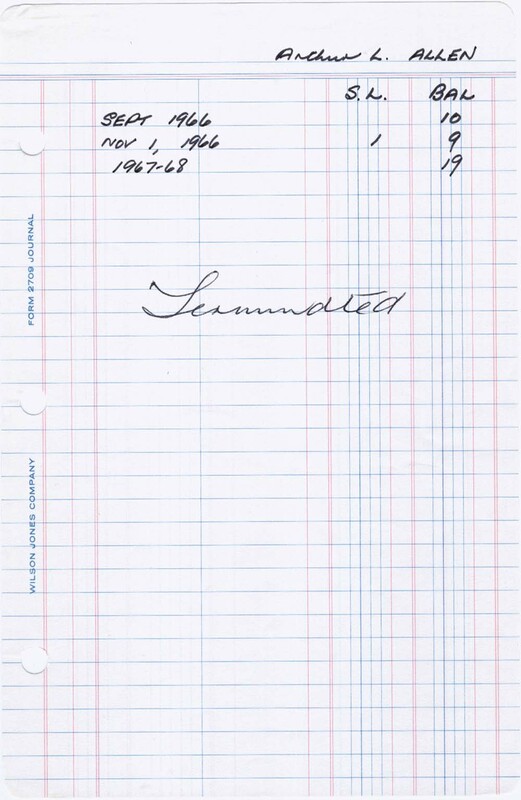 Feb. 8, 1968. 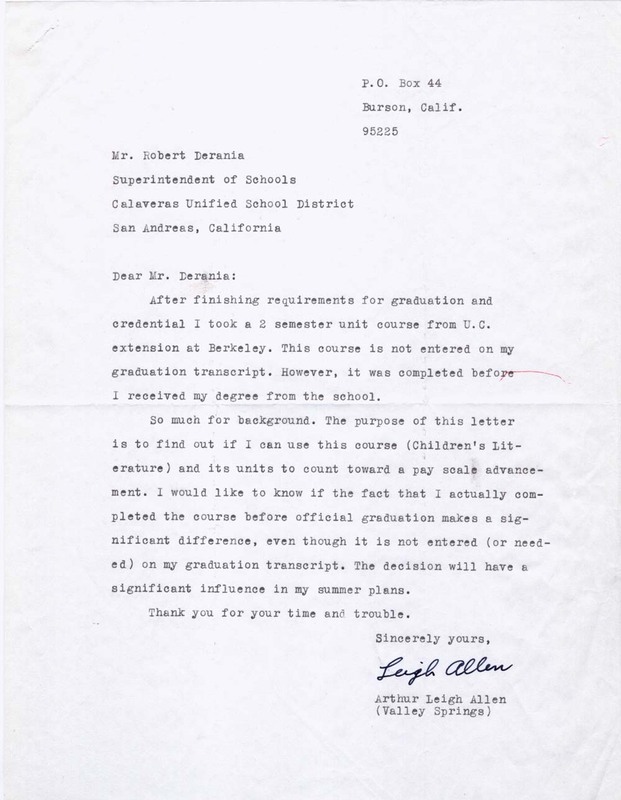 Allen's letter of resignation. 1968. 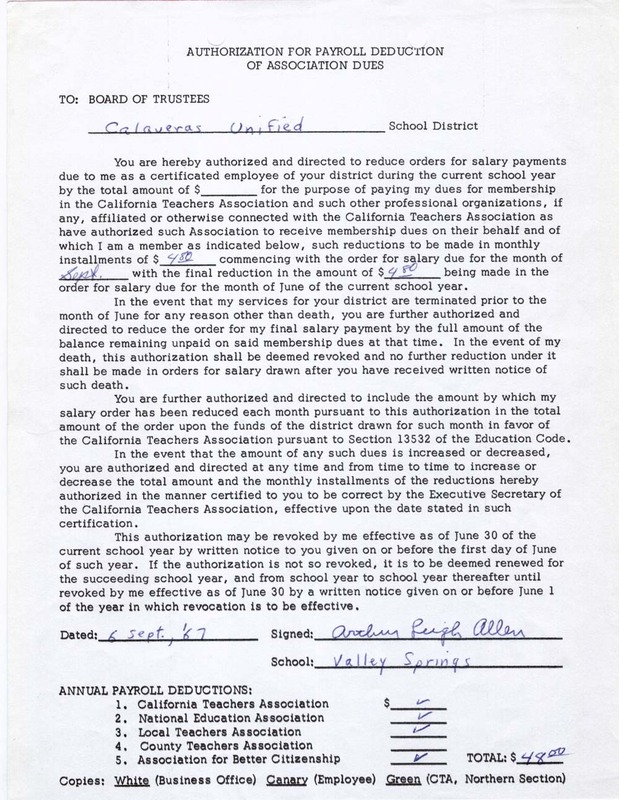 Allen's salary form. March 15, 1968. 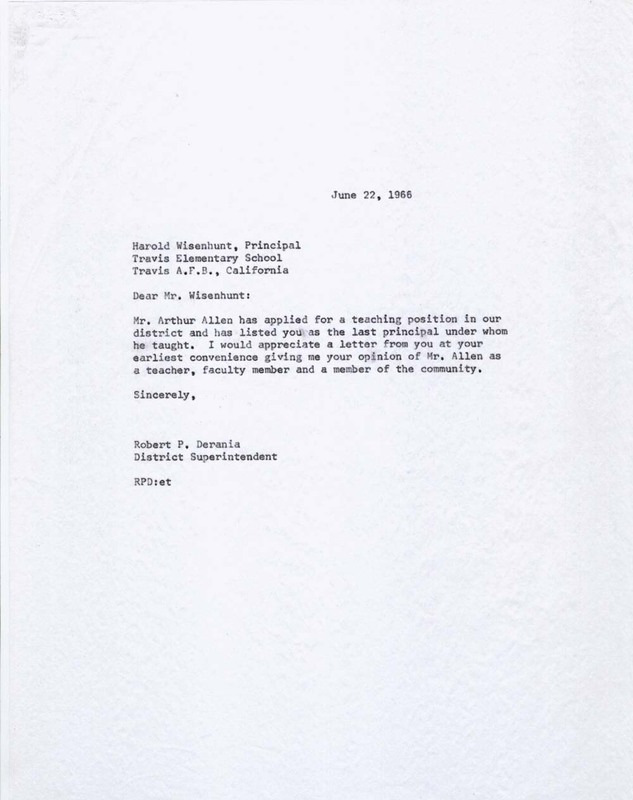 Department Of Education letter. 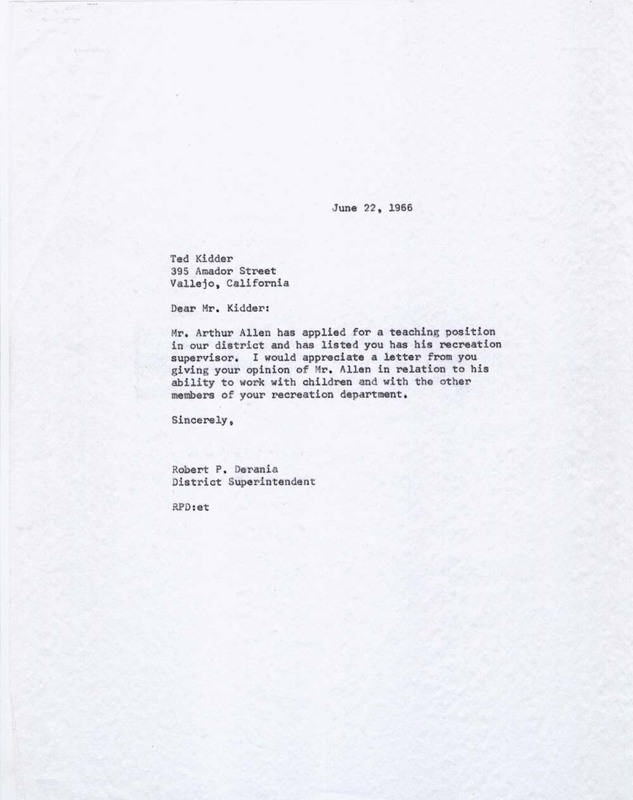 May 15, 1968. 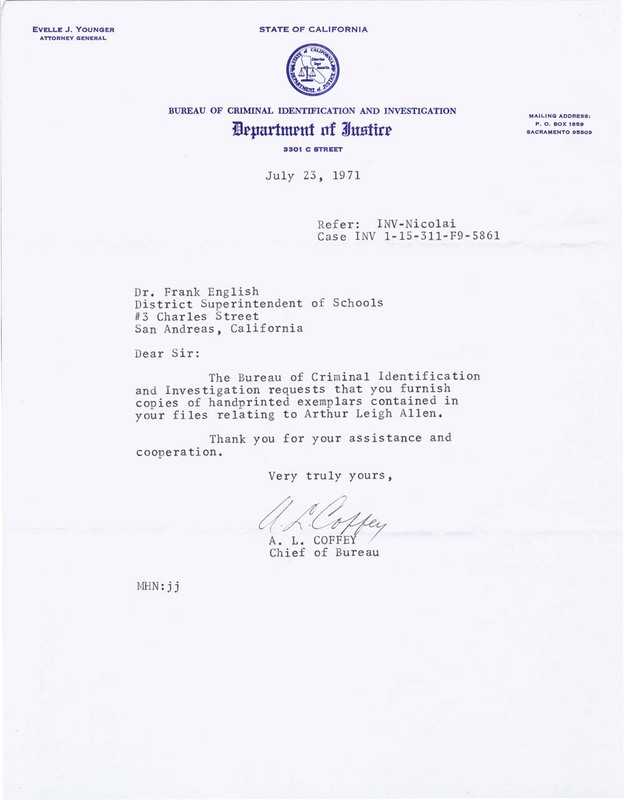 Department Of Justice letter. July 23, 1971. 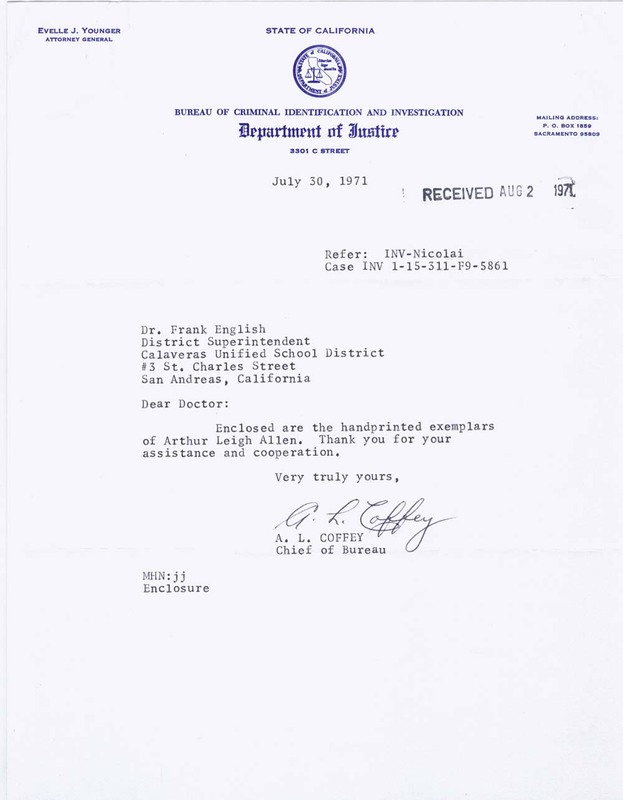 Department Of Justice letter. July 30, 1971. Calaveras County Sheriff's Dept. letter. March 26, 1974.